You'd be hard-pressed to find a hotter food scene in the world than what's going on in Singapore at the moment and if you really want to know what really makes its food tick, head to its hawker centres serving incredible local fare for pennies. Though it's a bit more fancy than hawker-centre fare, this uniquely Singaporean delicacy is much easier to make at home than you might think. Grab yourself a heavy crab, a wok, and a few basic ingredients, and you'll see why this icon of Singaporean cuisine deserves its excellent reputation. 1. Prepare the crab by dispatching it humanely, then pull the top shell (carapace) away from the body and discard the gills but reserve any of the yellowish tomalley from the head. Twist off the claws then divide the body into four pieces with two legs on each piece. 2. Blend the ingredients for the base paste to a smooth paste. Heat a wok over medium heat and add the oil. Fry the paste for about five minutes until fragrant and the oil separates from the solids. 3. Add the crab (including the shell) and salt and toss until the crab starts to change colour. Add the passata, stock, sugar, vinegar and soy sauce and toss to coat. Stir in the crab tomalley. Cover the wok and simmer the crab for 10 minutes. Add the spring onions and toss through. Taste the sauce and adjust seasoning. Drizzle the cornflour mixture slowly into the wok while stirring, then drizzle the egg mixture slowly into the wok while stirring. 4. 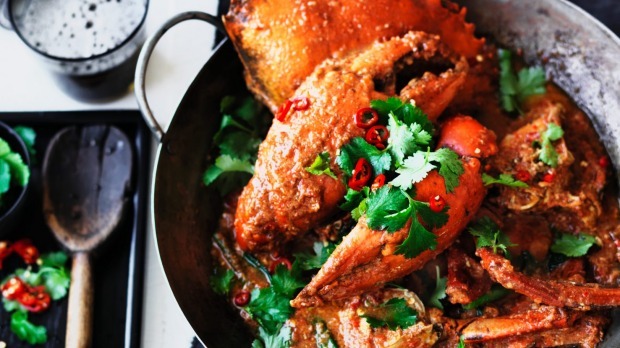 Remove the crab and sauce to a plate, scatter with coriander and sliced chilli and serve.